About the Book: Cole Hanson learned the jewelry trade early in life. Dealing in emeralds in Columbia, Hanson is kidnapped and taken to the mountain jungle lair of the Black Jaguar, a cocaine drug lord. He witnesses a horrible triple murder, executes the killer, and escapes. Hanson is overwhelmed by a euphoric rush and struggles with this discovered Jekyll and Hyde personality. Hanson is recruited to become an assassin for the CIA who learns of his strange predilection for death and uses this alter ego to press The Jeweler ever deeper into espionage and assassinations around the world. Murder occurs in England. Diskettes with top secret information about the Soul Catcher are stolen. Incensed, Hanson seeks the killers, but is on his own without CIA approval as clues take him across Europe and to the Vatican for revenge. After twenty years of service The Jeweler attempts his toughest sanction. Hussein is well guarded moving between palaces and seems an impossible target until fate deals a hand. Hussein flees on his mega-yacht. Hanson battles his way on board for the final action and twists in the Persian Gulf. Guest Post by Kenneth S. Murray: "How This Book Came to Be"
The area around Medellin, Columbia was the starting point for cocaine production and home for the drug cartels that have been so powerful. Years ago, cocaine was considered a recreational drug by middle and upper American society. But when I heard that it affected your 'winkie power' - yours truly said, "No way, Jose." Then I became allergic to alcohol - what a horrible development - a friend sent me some weed inside tennis balls and that was fun until I pulled on some Tai-stick, and it was ' Good-night Irene,' baby. That ended all that craziness. The idea for "The Jeweler," started up in the Panhandle of Florida where we were visiting our daughter who needed earrings fixed and introduced us to her jeweler - Rock Hard. Yep, that's what I said. Rock Hard Designs, Emerald Cutters & Importers At Monet Monet. The Monet is about the gardens behind his store in Grayton Beach, where he duplicated the look of the great French impressionist Painter, Claude Monet. Google his store - you'll see it first hand. I asked him about the word emerald on his card. He said he still owned an interest in an emerald mine in Columbia, a country known for those gems. Then when I learned about his early life, living in Paris where his father was stationed in the U S Army, college in Sweden, trips to Afghanistan where he became interested in the mining of jewelry, surfing the big waves in Hawaii, working for the BBC at 14,000 feet making a documentary about Peru, and the list goes on. I had to write it. He agreed that I could turn him into an assassin for the CIA, but I had to ask both Rock and his beautiful wife, Carla, to sign an indemnification agreement before I wrote the novel. But an editor from Simon & Schuster at a book conference taught me a lesson. I could not use his real name! "It's not believable," he said. "You write fiction, but you always need to create a believable story; have to have enough fact and history, etc, in a book to make it credible, acceptable to the reader. About the Author: Ken Murray lives with his wife Beth in Winter Park and has sons and daughters and three grand children. A graduate of the University of Virginia, he served in a top secret cryptographic unit of ht eU.S. Army in the Pentagon during the Korean war organizing intelligence from codes deciphered by the National Intelligence Agency. He moved to Florida in 1958, retired early, and for the past fifteen years has been writing novels and poetry. Visit him at www.kennethsmurray.com and www.facebook.com/KenMurrayAuthor. 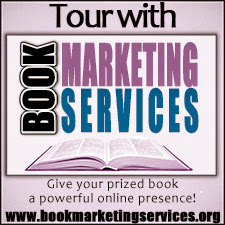 Sign up using the Rafflecopter widget below for your chance to win. 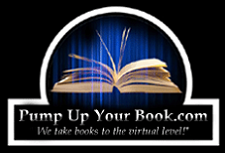 Good morning Jonathan, On behalf of Ken Murray and Book Marketing Services, I would like to thank you for hosting Ken today on I Read a Book Once. Ken will be by later in the day to respond to any comments and/or questions your readers may have. Please join Ken tomorrow when he will be a guest on Thriller Central http://thrillercentral.blogspot.ca/2013/01/why-i-love-reading-and-writing-thrillers.html. To all readers, please take a minute to enter the giveaway to win an autographed copy of The Jeweler. The Jeweler sounds interesting, as does the author's own life. I'll have to add this one to my TBR shelf. On behalf of Ken, I would like to thank you for your comment. 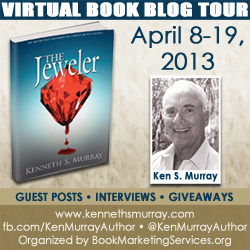 Ken hopes that you add The Jeweler to your bookshelf. 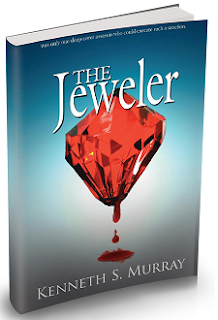 Remember to enter the giveaway to win an autographed copy of The Jeweler.